Dan Miller is an internationally renowned musician. He has taught music, conducted choirs and orchestras, and managed large concert productions and music conferences. He is respected as an innovative leader in handbells. Mr. Miller is well-known for his composing and arranging and has several published works. He has been seen and heard live in concert and through recordings on radio, television, and the internet. He has been the featured solo organist with several symphony orchestras. Dan Miller has recorded 22 organ compact discs. 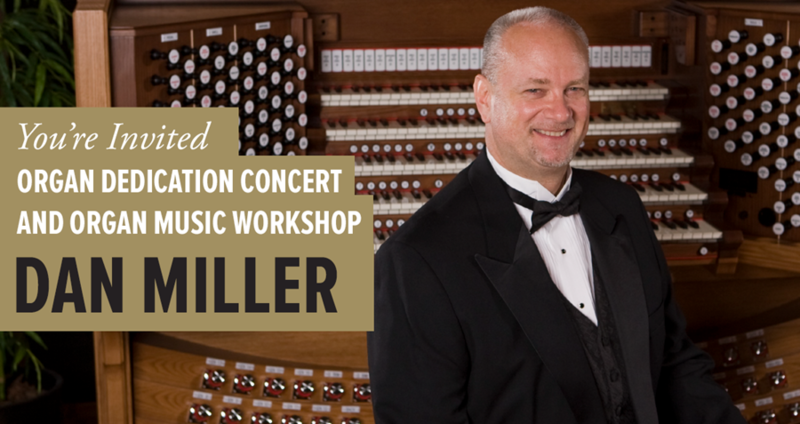 Mr. Miller is in his 20th year at Rodgers Instruments, one of the world’s leading organ builders, in Hillsboro, Oregon, as Rodgers Artist and Tonal Professional. He also is an Adjunct Professor of Organ at George Fox University in Newberg, Oregon. A church organist since age fifteen, Dan Miller has served at several notable churches. At Calvary Church in Charlotte, North Carolina, he presided over the world’s thirteenth largest pipe organ; at Coral Ridge Presbyterian Church, Fort Lauderdale, Florida, he served as assistant organist to Diane Bish. Currently, Dan is the Organist for St. Matthew Lutheran Church in Beaverton, Oregon. He also serves many churches nationwide as Guest Organist for their worship services. Dan and his wife live in Hillsboro, Oregon. They have two children and four grandchildren.